As we get close to voting time (2 more days) - lets start considering the options for the next theme. Lately we've gone through shop theme, pause, a dungeon, tackled a boss, and gone through an icy region. We don't necessarily need to follow any particular logic in this, so if there is some theme you'd like to try and create a theme for, speak up, maybe the idea is popular! I'll throw in Failure or Hope as my ideas to start with. I really like the idea of Failure as a theme but are we talking game over themes or are we keeping it broad as a theme? Have you guys done overworld themes by any chance? No overworld yet, but we surely will at some point. Also failure sounds cool to me. I was thinking that next month is OTC12, so we could make something special for the sort of "year 1 finale"
Sooo I made it in time too! The idea I had is of these travelers walking through snowy mountains, until a frozen, apparently empty palace made of ice stands in their sight. What's the story of that palace? Were there balls, banquets held by the people living in there? It seems like a good place to restore after such a long journey. My thought was to keep it broad. "Game Over" would be a plausible interpretation, but in my case I'd be mulling over the narrative sort of failure. I think "failure" or "game over" would be kinda cool but imo we'd possibly have to lift the 1 minute rule cause fail themes are often just short jingles. My vote goes for "hope" with the current rules. There are 11 entries so we'll try the alternative voting logic again. Each voter chooses top 5 entries. The most favored pick gets 5 points, second 4, and third 3, fourth 2, fifth 1 ... the voter gets 1 points for voting. The participant with highest TOTAL is assigned a score of 10, followed up by 8, 7, 6 ... 1 (never less than 1). The participant with most honorable mentions gets an extra 1 point when final scoring is given. If tied, both participants are assigned with the same values as if they won the position alone. I will wrap this up after Easter/on Monday. Also, chip in with your thoughts regarding the next theme, already briefly discussed above. And here's the playlist of the entries! My initial idea was traversing a dangerous, snowy mountain. But it could maybe work for other icy places. Lots of idiophone instruments; ended up sounding similar to my previous dungeon theme in some ways. Ok @everyone, I'm opening the dances with the voting. But before that: good stuff guys, all the entries were great! Floflo: Nice and chill I can definitely see it fit a snowy environment, even though I feel it'd fit more a village than a forest. Also has a somewhat nostalgic vibe to me, love the dynamic range too. vududish: I love this one, it is both static and dynamic, you really give the sense of snow floating downwards. Tyler Cunningham: I got some Nintendo64 vibe here, I can imagine this playing while exploring a snowy area. D-Sav: I like the idea of a frozen factory, sounds very cool. FERALUCE: Uncanny valley of snow. I like the sense of suspence, like anything could happen at any time. LordMev: Snowy, yet very warm. I was not expecting the second section to kick in like that, it was a nice turn. Tremendouz: This piece 100% fits your description. And I love it! Avaruussaha: Very contemplative, gives a sense of space and movement. Needless to say, brilliant performance once more, I am always impressed by how much variegate is your mood palette on guitar. Mairiba: I want to make a snowman now. Little special shout out to: Metatron, LordMev & Tyler! I'm ready to vote! Sorry I've taken a little while. I should have left a comment on everyone's piece directly. All entries were really well done and unique, this was a tough choice.to choose only five. 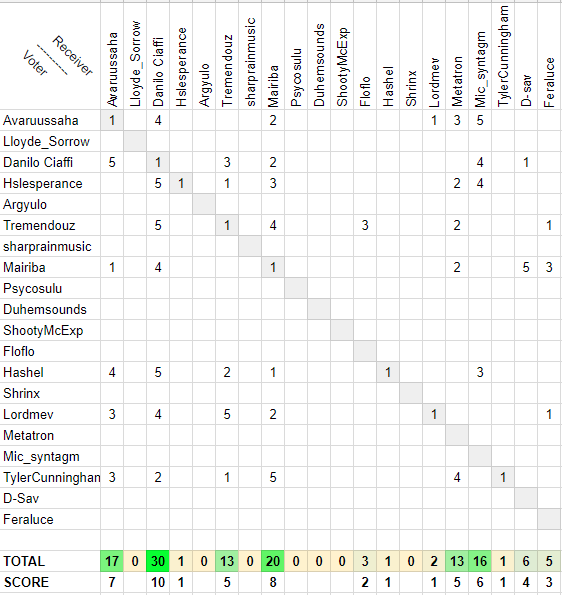 Everybody did an awesome job on their compositions, this was a really fun contest, looking forward to the next one! "Hope" seems like a cool next theme. @floflo79 - Really pleasant. Sounds like Chrono Cross in the first half. But just like your home town theme, the constant single percussion is a bit overbearing; even a little change in dynamics on certain strikes would help. @MetatronLives - Great use of empty space and reverb, gives that feeling of wide open fields of snow. @Mic_syntagm - Walking through a snow-covered forest under dawn's light in search of ...something, or perhaps nothing. @D-Sav - Oppressive and aggressive. The part around 0:45 probably has the strongest icy sound with those bell sounds and piano chords. Unique take on the theme. @Feraluce - Uneasy, almost like exploring an alien world. I actually thought some of your other tracks had more of a wintery vibe than this one, though in a cheerful/Christmasy sense (beautiful piano/string work on your other songs). Perhaps Magus, Karth, or Fera would have been a better choice. Although I should point out to you and some other newcomers that we usually like to encourage songs written specifically for this contest, after the contest theme has been picked. @Lordmev - Good instrument choices and sound design, especially the plucky synth doing the melody. Tremendouz - Inspiring and adventurous. Would go great in a big-budget fantasy movie with wide panning shots of a mountain range. Avaruussaha - Love me some Acoustuussaha. Mairiba - I'll forgive the sleighbells (it's just so overused in VGM winter levels) since you actually recorded them live, and because the rest of the song is so well written. Danilo_Ciaffi - Gorgeous. The high piano notes are beautifully chilling. Also listened to Candy Town. My picks based on how they fit the theme and loopability (I always listen to each entry a few times). Also forum user @birdnet who participated in some of the early months made this song recently. I'll give a vote to "Failure"
No comments this time unfortunately but everyone did awesome job so it was very hard to rank these. See you next month hopefully! As we are just pending me, I'll hurry up with my results straight... Good stuff from everyone! 5th: LordMev - Calm Snow ... Initially it does feel calm, but to me it seems like the snow just keeps on piling and becomes heavy snow. Snow nontheless, snow. 4th: Mairiba - Houhou Village ... Waltz, acoustic... Yes! Actually makes me think of a fireplace, couch and hot cocoa, for which you don't need an icy region, but it sure as hell belongs there. 1st: Mic_Syntagm/Vududish - neveneve ... makes me think of the sound of walking on snow, and not much else. Very fitting! Danilo_Ciaffi returns to his reserved spot as the votesponge! Also as I count them, the votes between hope and failure were split even. Since there was some doubts about the failure and relation to "game over" jingle (which I'm trying to avoid ) , I'm just going to make things easy and rule we go for Hope this time!